KillerStartups > Startup Spotlight > Hitask: A Project and Task Management Software that Gets Things Done from One Place. Hitask: A Project and Task Management Software that Gets Things Done from One Place. When it comes to project management there are hundreds of concepts, methods, and software in the industry. It gets really complex when you want to manage projects, tasks, and people with multiple apps when most of them aren’t connected with each other. Hitask is a project management software inspired by David Allen’s GTD (Getting Things Done) methodology. It helps focus on projects, tasks, and people from one place. Removes distractions caused by switching from multiple apps, keeps the team on the same page with automatic status notifications, and simplifies workflow dramatically. Hitask also has iOS and Android apps making it easier to create, assign, or track tasks on the go. These are synced with the main account to keep everybody on the same page, securely. 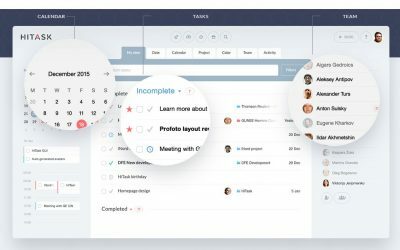 ● Organize and categorize work with projects, tasks, events, and notes. ● Upload and attach files to tasks and projects. ● Stay on track with team members by sharing the same calendar. ● Collaborate by sharing tasks with specific people. ● Track time spent on each task with time-tracking. ● Available for iPhone, iPad, and Android. ● Get reminded of task statuses with email and push notifications. ● Get progress reports with a single click. ● Chat instantly from one place. ● Use sub-tasks for breaking down large projects into chunks. ● Comment on projects and tasks. ● Tag projects and tasks by color, priority, context. ● Set deadlines and get notified when due dates are near. ● Support for 10 languages. ● Synchronize with Google and Outlook calendar. ● Export data with a single click. Lots of marketing agencies, design companies, IT consultants, startups, and SMBs already use Hitask in their own way to increase their productivity. Create your account with Hitask which is free for up to 5 users and start managing your project from one place.